A quote from The Big Bang Theory which I watched last night. A justification for all the little things I make! Cast on 28 sts in pale yellow. Row 7: p1, (k3, p1, k1, m1, k1, p1) 4 times, k3, p1 - 37 sts. Row 10: (k1, p1) in pale yellow, p4 in white, (p2, k1) in pale yellow, p4 white, p3 light yellow, p4 white, (k1, p2) in pale yellow, p4 white, (p1, k1, p1) in pale yellow, p4 white, (p2, k1) pale yellow. Take care on this row to make sure you bring all the strands across the wrong side of the knitting. Row 11: (p1, k1) light yellow, (k2, m1, k1, m1, k1, m1, k2) white, p1 light yellow,(k2, m1, k1, m1,k1, m1, k2) white, k1 pale yellow 3 times, (k2, m1, k1, m1, k1, m1, k2) white, p1 pale yellow - 52 sts. Break off pale yellow and continue in white only. I will have a stall at The Crafty Market in Dublin city this Sunday, 1st August. Lots of lovely handcrafted goodness. Plus some music. A little christening gift for a little girl. First off a teddy bear, pattern by Laura Long. The pattern is easy to follow. I found the teddy a bit plain until the fabric pieces were added. Now it looks kinda' cute. And a bonnet and bootees set. They're from an old Patons book I have. Another simple pattern that looks really good. A totally unprompted comment from my little darling today. Makes up for all the screaming sessions! I signed up to this swap last week. 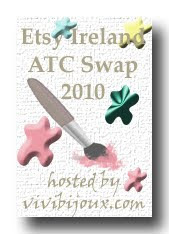 Its an ATC swap for members of the EtsyIreland Team. I did an ATC swap last year, run by Kate of Kate's Quilting. It was really good but you had to make an ATC for everyone in the group and it was hard to keep to momentum to make over 30 of them. So, this swap will be nice. One little ATC to make by September. Just need to decide now what I'm going to make! Meant to blog last night but I had a little girl in a big-girl bed for the first time and DH was out so I spent the first hour and a half up and down the stairs. We got there in the end though! Then had to spend the rest of the evening making a custom order for one of my regular readers. 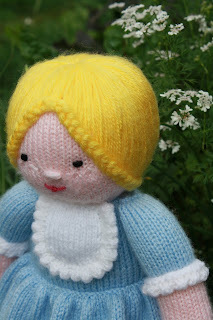 So finally, to the knitting (and the aforementioned little girl!). This pattern I found on Ravelry, as always. Its called Daisy Cardigan. It was a very easy pattern to follow and I really like the swing of the cardigan. I did make a few changes. I noticed my gauge was a bit out while knitting so I did more increases than called for to insure that it fit Smem, and I added buttonholes into the edging rather than having ties. Congratulaions! A copy of the pattern will be winging its way to you today through cyberspace. Thank you to everyone who entered and thanks especially for all the lovely comments. Its typed up. 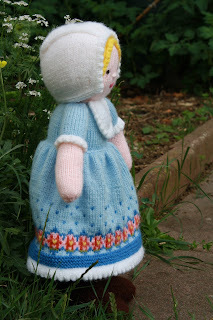 The pattern for Gretchen is now available for sale in my Etsy shop and through Ravelry. But for all you loyal readers, I will have a little giveaway to win a copy of the pattern. Leave a comment (with some sort of contact details). A winner will be chosen at random on Sunday 18th July 2010. Very quick and easy pattern to follow. Another pattern from Ravelry. This one is called 'Robe d'Ete' (summer dress). The pattern comes in two sizes - for ages 2 and 4. However, there are no measurements or gauge so the first dress was a bit more of a miss than a hit. I made the size 2 in pink cotton but it was just a bit too tight across the back. So this is the size 4 one, in green cotton. The fabric for the dress is from a pyjamas bottoms that I bought in the charity shop for 1 euro. Of course, this dress is too big! I don't think it'll be too long 'til she grows into it though. Some of the toys I made for the market yesterday. Thought they were too cute not to share! Not a great day today. Although the Crafty Market has moved into the city centre there was not much footfall. But it seems to have been a particularly bad day and has been better previously so I must try it out again. Made enough to cover the cost of the stall, so its okay! Myself and Smem headed down to my parents in Wexford this week. Cue lots of trips to the beach and various playgrounds. And for the first time, Smem was okay walking on the sand in her bare feet. And she loved it! And loved the sea. She even did a pretend little doggy-paddle in the water when my mam was holding her. Such a big leap. We've also been potty-training the last two weeks. And its gone really well. She does still wear the pull-up nappies a good bit but wants to go in the potty so I suppose that's the biggest challenge. And now we've bought some 'Peppa Pig' knickers so she wants to wear knickers now! This week my crafting has been for the market this Sunday. I've knit one Humpty Dumpty and am trying to get another done. So fingers crossed I get it done, as its on tomorrow.